We frequently receive email nominations, but this is not the most effective way to nominate content. In order to ensure that your nomination is seen in a timely manner by the weekly editor-in-chief, we prefer that you nominate content using the Nominate This bookmarklet. This method not only makes the nomination immediately visible to the editor-in-chief, but also retains the metadata associated with each nomination. This metadata allows us to track the metrics of the associated post. Using the Nominate This bookmarklet is the most convenient way to nominate content. The Nominate This bookmarklet is an application that runs in your browser. If you find a post that you think would make a good Editors’ Choice or News item for DHNow, you can nominate that item directly from your browser. Once the bookmarklet is installed all you have to do is click on the icon located on your bookmarks toolbar. A popup window will appear where you can view the content of the post, select appropriate categories, enter the author’s name, and, finally, nominate it for inclusion using the “Nominate” button. The Nominate This bookmarklet is especially helpful for nominating interesting content that does not appear in the “All Content” section of the PressForward plugin. The Nominate This bookmarklet also allows you to nominate the RSS feed associated with a nominated item for inclusion in DHNow’s selection of RSS feeds. Why Nominate an RSS Feed? Nominating an RSS feed will allow DHNow to automatically aggregate new content from the web. The editors-at-large then select content from this pool of recent postings. 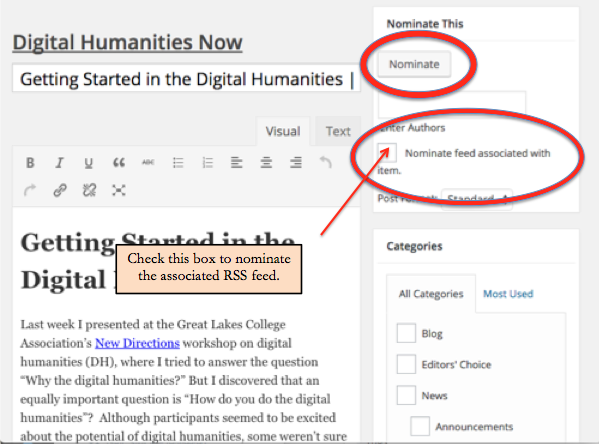 You can nominate a feed using the Nominate This bookmarklet (above) or by filling out a form on the DHNow website. The form can be found here. When nominating a post, the bookmarklet provides an option to nominate an associated RSS feed. How Do I Download the Nominate This Bookmarklet? In order to use the Nominate This bookmarklet, you need to do two things. First, you must create an editor-at-large account and volunteer to review content for at least one week. 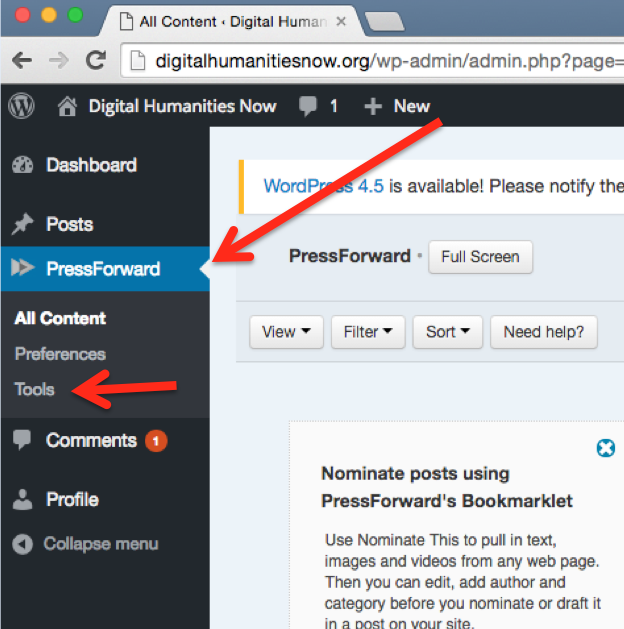 Once your account has been confirmed, you will be able to review and nominate content using the PressForward plugin within DHNow. Once you have served as an editor-at-large once, you can use the Nominate This bookmarklet to nominate content anytime you wish. You can now download the Nominate This bookmarklet by dragging the icon into your browser’s bookmark tool bar. Make sure that your bookmarks bar is visible. That’s it! Once you have successfully installed the Nominate This bookmarklet, a “Nominate This” icon will appear in your bookmark bar. You are now ready to quickly nominate content! If you are experiencing issues with the Nominate This bookmarklet, please make sure that you are using the latest version of PressForward. After updating the PressForward plugin please make sure to uninstall the bookmarklet (delete the bookmarklet from your bookmark bar) and then reinstall the updated bookmarklet from the tools tab in PressForward.